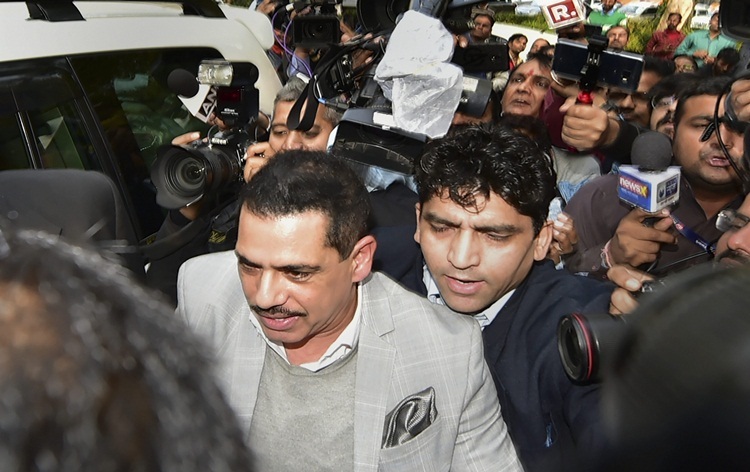 Businessman Robert Vadra appeared before the Enforcement Directorate for the second day today in money laundering case probe and his questioning is on. The agency had questioned him yesterday as well. This is the first time that Vadra is appearing before any probe agency in connection with alleged dubious financial dealings. The ED case against Vadra relates to allegations of money laundering in the purchase of a London-based property worth 1.9 million pounds. His statement will be recorded under the Prevention of Money Laundering Act. Last week, a Delhi court had directed Vadra to appear before the central probe agency and cooperate in the probe after he approached it seeking anticipatory bail in the money laundering case. Vadra has denied the allegations of possessing illegal foreign assets and termed the allegations as a political witch hunt against him. Son of former Finance Minister P Chidambaram, Karti Chidambaram today appeared before the Enforcement Directorate in connection with INX Media case. Karti was summoned by the agency. The Enforcement Directorate has questioned Karti on several occasions in the case which is being probed by the agency and the Central Bureau of Investigation. Both are probing how the Foreign Investment Promotion Board, FIPB, gave clearance to foreign investment in INX Media in 2007 when P Chidambaram was the Finance Minister. The ED had registered a PMLA case based on a CBI FIR and alleged that irregularities took place in the FIPB clearance to INX Media for receiving overseas funds to the tune of 305 crore rupees. The agency has also questioned P Chidambaram twice in the case for giving FIPB clearance to the INX group. On February last year, Karti was arrested by the CBI for allegedly accepting money to facilitate the FIPB clearance to INX Media. He was later granted bail. The ED has attached properties worth 54 crore rupees belonging to Karti and a firm in the case.